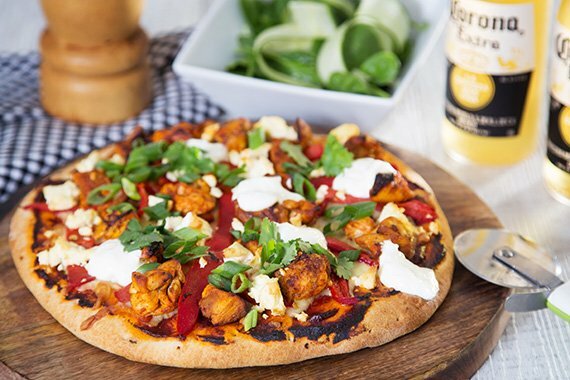 A nice little fusion of Italian and Indian - Tandoori flavours on a pizza, who would have thought! Served with a simple salad of tomato, cucumber and rocket, it's your Friday night pizza sorted. Enjoy with a crisp local lager and it's a cracking way to end the week. Share the moment #youplateit with us on Instagram. Preheat oven to 250°C until nice and hot. Pat dry chicken with paper towel and cut into 1 cm dice. Coat chicken well with tandoori paste. Heat olive oil in a pan over medium-high heat. When oil is shimmering, add chicken and cook until browned on outside, about 3 minutes per side. Transfer to a plate and set aside. Slice fire roasted capsicum. Add pizza base to a lined baking tray. Spread tomato paste over the base and top with pizza cheese. Add cooked chicken pieces, fire roasted capsicum and fetta (crumbling as you add). Place pizza in oven and cook for 10 - 12 minutes until the base is browned and crisp, or done to your liking. While the pizza cooks; wash the fresh produce. Using a peeler, slice the cucumber into ribbons. Pick coriander leaves (discarding stems). Thinly slice spring onions on a slight angle. Remove pizza from the oven, dollop yoghurt on top and garnish with coriander. Top with cucumber ribbons and spring onions. Cut into slices. Enjoy!